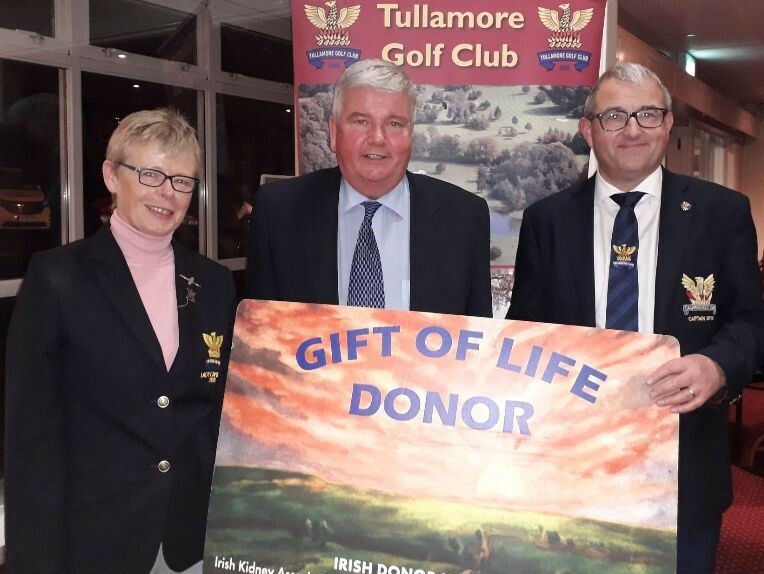 Lung transplant recipient Val Kennedy, from Portarlington, Co Laois was given special recognition at an awards presentation hosted by Tullamore Golf Club on Saturday night 3rd November for increasing organ donor awareness and competing in the European Heart and Lung Transplant Championships which were held in Italy in June 2018. Around 200 people attended the special event at Tullamore Golf Club which celebrated the accomplishments of its successful teams and individual members. While being honoured at the event Val Kennedy, a Tullamore town native, was happy to share the message about the importance of organ donation and transplantation and with the support of kidney transplant recipient Dermot Glynn on the night, many of the attendees were inspired to take home organ donor cards. Val, an avid golfer suffered a sudden and dramatic health decline in April 2015 just four days after winning a golf competition at Tullamore Golf Club. A lung transplant was his only hope of survival after receiving a diagnosis of Idiopathic Pulmonary Fibrosis which left him 24 hour oxygen supply dependant, The former Tullamore businessman underwent his life saving single lung transplant in Spring 2016 at the Mater Hospital Dublin. Following the Golf Club's awards night, Val Kennedy said, I feel honoured and grateful to be among the wonderful talent given special recognition by Tullamore Golf Club. It's thanks to my donor who gave me the gift of life that I am here today. 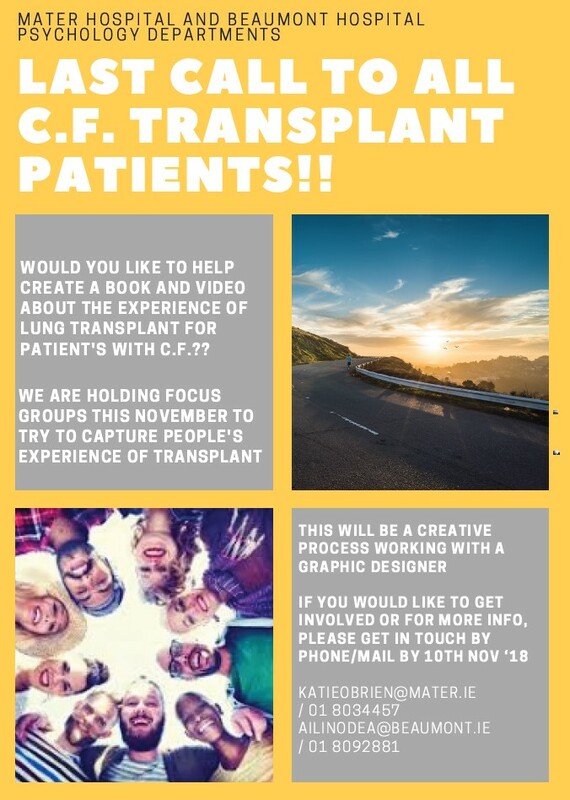 A gentle reminder that the next transplant group will be next Monday 22nd October. This is one week earlier than usual as the following week is a bank holiday. Based on feedback from the last group the time is also different- it will be from 1-3pm. For this group we will be joined by Denise O'Reilly, Art Therapist, who has very generously offered her input to the group. Tea, coffee and biscuits/ fruit will be provided. Location: Level 6 St Cecelia’s Meeting Room, Whitty Building. Interactive Sessions: Specialist Nurses, Physiotherapist, Pharmacist, Medical Social Worker. Open to Heart and Lung Transplant Recipients and Caregivers. As number are limited, booking is required, please contact the Heart and Lung Transplant Unit. Due to unforeseen circumstance, we have been forced to postpone our awareness day this Friday. Stay tuned for a new date.